First discovered by Randy Lindsey (Propagator at Panoramic Farm USA) as a sport on the well known Abelia × grandiflora ‘Little Richard’ . A. 'Kaleidoscope' carries with it all the wonderful attributes of it parent - dense, compact growth habit with a high foliage retention during the dormant winter months. The really stand out attraction of 'Kaleidoscope', however, is the dynamic color it brings to the garden landscape. New, variegated growth emerges as bright yellow with a light green centre throughout spring gradually turning to golden yellow with deeper green markings into the summer months intensifying in colour rather than bleaching from long, hot summer days. By autumn this combination turns to a bright orange to fiery red throughout the winter months extending until the early spring. These colours are further highlighted by the brilliant red stems and the abundance of dainty white flowers first appearing in summer. Exceptionally easy to grow and maintain once established, this versatile shrub will serve many purposes in both commercial and home garden schemes. 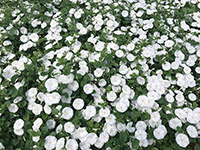 All white flowering form of this popular and versatile ground cover. Prolific and long lasting floral display - all through the warmer months. Dry tolerant with dense and spreading habit. Will cascade over rocks and walls. • Improved form of popular ground cover with far denser, neater habit. • Deep blue, funnel-like flowers through the warmer months. • Low maintenance, dry tolerant and easy to grow. • Will trail over rocks and walls. Bred specifically to support Alzheimer's research is the beautiful Dianthus 'Memories'. With a pure white bloom, 'Memories' comes from renowned Dianthus specialists Whetman Pinks in the UK. With all the characteristics we have come to expect from modern Dianthus, 'Memories' shares these and more. Long flowering blooms held on sturdy stems, dry tolerance, delightful fragrance and exceptional hardiness are the hallmark breeding traits of its cousins in the well known Whetman Pink Scent First Collection and 'Memories' certainly shares these outstanding features. 'Memories' was purpose bred to raise funds for Alzheimer's research with specific reference given to the strong link between scent and memory. 'Memories' is a fitting variety to represent such a worthy cause. Of all the 5 senses, scent is proven to be the most powerful trigger of memory. The delightful fragrance of 'Memories' will no doubt transport many of us straight back to our grandmothers gardens and spark fond childhood reflections. The Dianthus Scent First Collection are bred by the renowned Whetman Pinks in the UK, known for their delightful fragrance and striking flowers. D. 'Pinball Wizzard' flowers are streaked and speckled with multi-shades of pink for a unique and striking display. An elegant addition to gardens, repeat blooming over the spring months. Very hardy and easy to grow with good dry tolerance. A range of salvias aptly dubbed the ‘HEATWAVE’ range was introduced as a direct response to the current dry climate faced by Australian gardeners. Salvias are only too well know worldwide as a waterwise family of plants that revel in sunshine and dry, open soils. The HEATWAVE range takes todays gardening requirements one step further being purposely bred to retain a compact habit as many forms of salvia greggii typically present with more open habits which, whilst still effective in the right position, relegate their use to background planting or intermingling in a loose perennial border. The tighter foliage of the HEATWAVE salvias allows them to be a given more prominent location in a garden setting which they well deserve considering they provide colour all through the warmer months right through autumn. Salvia Heatwave Blaze, has vibrant crimson coloured flowers that won’t wash out under our bright summer skies. Aromatic, evergreen shrub which is easy to grow and very tolerant of dry conditions. Produces massed displays of apricot coloured flowers throughout the warmer months. Ideal for water wise gardens or displayed in large tubs. Ideal for attracting birds to the garden. Very hardy and and easy to grow perennial for water wise gardens. Numerous spikes of mid pink flowers with white eye appear over a lengthy season. Main flushes in spring and autumn with repeat displays throughout warmer months. Foliage is evergreen and aromatic when brushed. A range aptly dubbed the ‘HEATWAVE’ collection was introduced as a direct response to the dry climate faced by Australian gardeners. Salvias are only too well know worldwide as a water wise family of plants that revel in sunshine and dry, open soils. The HEATWAVE range have been purposely bred to retain a compact habit - many forms of salvia greggii typically present with more open habits which, whilst still effective in the right position, relegate their use to background planting or intermingling in a loose perennial border. Salvia Heatwave Sparkle, has vibrant pink coloured flowers that won’t wash out under our bright summer skies. A lengthy and dramatic display of glowing crimson blooms encased in contrasting black calyces. A fast growing, dry tolerant hybrid. Strong, bushy variety with glossy foliage - ideal for mid border positions. Attracts bird life and pollinators. Tolerant of both coastal conditions and lightly shaded areas. • Striking flowers of soft lilac colour with high volume of blooms produced in spring. Further flushes continue throughout the warmer months. • Very compact and dense growth habit. • Very compact and dense growth habits. • Striking flower colour of deep purple with high volume of blooms produced in spring. Further flushes continue throughout the warmer months.